I grabbed a new 1TB drive to put Time Machine backups and my media on. I can’t believe that you can get 1TB for just a couple of hundred bucks. Wow. 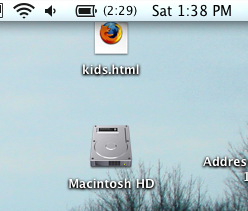 I really like what Time Machine is trying to be. Running backups has been a royal pain for the longest time. I know that there are other packages out there, and tar can even be your friend, but I have seen constant pain from non-technical family trying to get backups sorted out. On line: Have the data stored in the sky. Maybe you use a hack on top of S3 (make sure to diff so you don’t send huge amounts all the time). .Mac is another choice for Apple folk, but the limits are poor. The future is surely in the “data in the sky” approach though. Backing up the data on your main machine is simple. The problem that I have is that the data that I have can not fit on my machine anymore. If I take my video, music, source code, and all of the other assets I need a lot of space. Too much for my laptop hard drive. I need a solution that maps to space as well as time. I want to be able to selectively tag data as “this goes on my laptop” and “this can go on my mac pro” etc. I need the system to understand that I have a lot of data, and a subset is sync’d for me. My use case seems to break a lot of the tools, and means that I have custom scripts to manage it all. And, it is a pain. So, I am looking forward to Space Time Machine, a solution that takes this all into account. I cuddled up to the Leopard and once you install an OS you kinda think “erm, ok. now what?”. I think this is my number one feature request for Gmail, so it is great to see it role out. 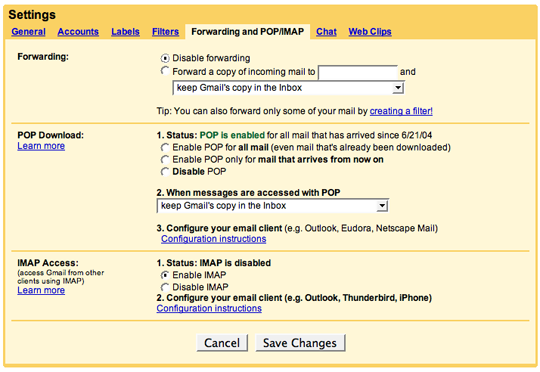 Since Gmail is tag/label based, it isn’t as easy to implement IMAP as it may seem, so good job dev team! And now, I can finally do the same for my personal email account. Check out the automatic labels that you get. I just posted about the Sun announcement on Java Applets 2.0 (even if the PR folk kept telling us it was an “update” not an “announcement”). The web community tends to poo poo the applet. We scoff at the startup time. We complain at the cross browser issues that went against the point. We moan at the speed. We groan at the image mouseover examples. However, if we get off of our high horse for a minute and think about what a world where Java in the browser was actually decent, we get an interesting picture. If the plugin could be in control of the cross browser / platform issues, then it could allow us to write rich components that work on all. We could build and register a really nice file upload component for example that takes over type=”file” to do a lot more. We could use JNLP (or something else) to register the modules, and when we get winners, could even standardize them. If the Java Plugin is done well, it could become a platform to build on. This is a big if though, and there is the spectre of Java 1.x in IE looming out there. Is there a way to get around that though? As I think about this, Gears and Java could actually do some interesting work together. I was really glad to hear that my ruby in the browser toy is probably going to happen for real shortly. When we interviewed Ken Russell of Sun he talked about how JNLP will be supported in Applets, so you could write a JNLP extension for JRuby, and have every Ruby app just use it. No more mega download all the time. Finally we can stop talking about if it is coming or not… and second guessing Apple. It’s coming. Things just take time. I can’t wait to see the applications that people come up with for the phone now. I have been amazed at what creative hackers have been able to do without an SDK…. so WITH it…. There is another post on tricking spam bots by putting in hidden fields and assuming that if the field is filled out, it was by a bot. Of course this is a constant arms race, and this doesn’t help for blind folk. I did prefer it to normal CAPTCHA. 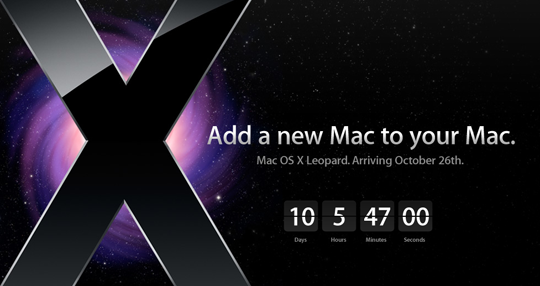 Leopard is coming. Will there be any cool secret features? I have said before that I am not that excited about the OS itself…. but finally we will get to see all of the new apps that people have been holding back because they rely on Leopard. Google Maps integration with Address Book. Automator UI recording / playback. Front Row now looks more like “Back Row” (the Apple TV interface) — too bad it’s still not more like Media Center. New AirPort menus that show WiFi encryption. Disk encryption now supports 256 bit AES. Built-in grammar checker. Lord knows we need it ’round these parts.